Here is a scholarship opportunity for you guys! The Shawn Carter Scholarship Fund (SCSF) was founded on the belief that any motivated individual in need should have the opportunity to further his or her education. The SCSF provides individual grants, paid directly to the educational institution, to every student who qualifies and reapplies yearly, from admission to graduation. The grant can be used to cover tuition expenses and related supplemental educational expenses such as books, lab fees, travel and select costs of living. The purpose of this post is to inform you that today at 9:30am, the Da Vinci high schools at 201 N. Douglas St. successfully completed a shelter-in-place emergency lockdown drill. Da Vinci Design participated in this drill in coordination with the El Segundo Police Department, as well as with Da Vinci Science, Da Vinci Communications, and the administrative offices of Da Vinci Schools and the Wiseburn Unified School District. The drill lasted approximately 15 minutes, during which time the building went into a complete lockdown as it would if there was an actual emergency. Thank you to our students and staff for your full participation and cooperation. As always, our top priority is the safety and security of our students and staff, and drills like this are important opportunities for us to practice and improve our safety and security procedures. The El Segundo Police Department — represented by our School Resource Officers Scott Black and Joe Cameron, and two additional officers, Scott O’Connor and Jeff Darringer — observed today’s drill and participated in a debriefing session with school leaders and administrators. ESPD gave us high marks for the speed and efficiency in which students and staff were able to lockdown in classrooms. They also provided important feedback to continue to refine and improve our emergency protocols. Please take the time to discuss today’s drill with your child. 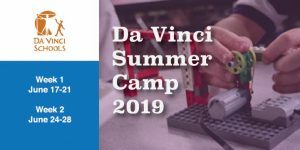 If you have any questions about this event or any safety procedures at Da Vinci Schools, please contact the front desk at your school or Vicente Bravo, Chief Administrative Officer, at vbravo@davincischools.org. We wish to extend a special thanks to the El Segundo Police Department for their collaboration in promoting the safety of our students. Thank you for your support in ensuring the safety of our schools. Every year, the Da Vinci Schools work with local first responders to plan, prepare, and practice our responses to emergency situations, including earthquake, fire, and emergency lockdowns. Since moving into the new building we have been working with our Student Resource Officers on these plans. We have an emergency lockdown drill planned for the morning of Tuesday, April 2nd. Staff is trained for how to respond to such an event and prior to this drill, procedures for students will be reviewed with them. During the drill, students will have a chance to practice the proper response if such a crisis were to occur. During the drill, be advised that the reception desk will be temporary closed to any visitors, parents and/or students arriving during the time of the drill. No one will be allowed to enter or exit the drill. If you have any questions regarding this or the drill, please do not hesitate contact the front office of your child’s school. Thank you for your support in maintaining the safety of our students, staff and schools. A friendly reminder that we will be hosting an information meeting tonight, March 28th, at 6pm at the 201 campus in the Multi-Purpose Room. Come join us for an information presentation and Q & A time! Can’t make it in tonight? Zoom into the meeting using the link below! We look forward to meeting you and answering any questions you have about our program. At Quarter Zero, it is our mission to power the potential of young people. We offer immersive summer entrepreneurship programs – a 6-week Catapult Incubator and 5-day QØ Startup Camp – that equip students with the skills, mindset, and confidence to thrive. SCHOLARSHIPS ARE AVAILABLE for both these programs. For more specific information about these programs see the attached flyer. 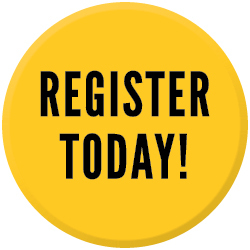 Check-in begins at 8:15 A.M., the event begins at 9 A.M.
What: Warrior Smart Start is an opportunity for new students starting Fall 2019 and their families to get an introduction to everything El Camino College has to offer. Students can attend a resource fair and workshops about preparing for the first semester, joining a support program, transfer strategies, and more. We will also have open labs for students to complete the Level Up assessment survey and apply for financial aid, South Bay Promise, or support programs. Students can also complete steps to enrollment (orientation, assessment, educational planning) to be eligible for priority registration. Student must have already applied to El Camino College and have a Student ID number to complete these services. As we begin this week, we wanted to take this time to thank all of you, the parents and guardians, who came out last week to participate in your children’s Student-Led Conferences (SLC). Our students shared their accomplishments and their goals for improvement along with an action plan to reach those goals. These are a very important part of the education of our students which help to ensure a high level of communication between them, the staff and you. In light of recent events that occurred with some of our neighbors, in particular the Elevon Campus located on Douglas Street north of the Da Vinci schools, we are asking for your cooperation in adding one more goal for all of our students that includes you too: Being good neighbors. Last week we were again notified by businesses in the area that some of the actions of our students have been anything but neighborly. Unfortunately, this is not something new, as this was addressed back in November 2018. 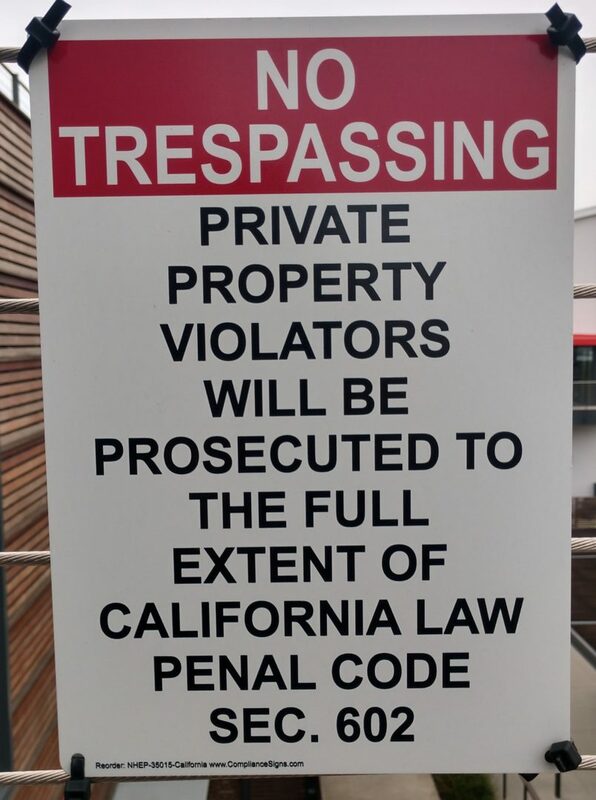 Several of our students have been ignoring posted signs (see below) and were caught trespassing in areas that are private property at the Elevon Campus, such as the second story which has no stores or locations open to the public. They were disruptive and rude to several of the employees that work there. We are all in agreement that these students do not represent all of the wonderful students we have attending our schools, but the very public actions of these students reflect poorly on us all. This has been a recurrent problem since late last school year, and the business owners have been extremely patient and cooperative, working with us as much as possible to address this matter. 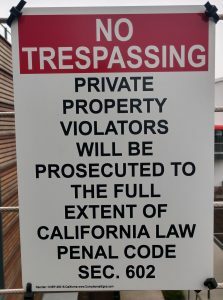 However, because of the level of disruption experienced last week, it has now reached a point where Elevon will be addressing future incidents of students trespassing on private property with us AND the El Segundo Police Department. Students are not allowed to loiter at the Elevon Campus and must be accompanied by a parent or guardian at all times. The message to our students that they need to hear from you is this: Please respect our neighbors in the community and conduct yourselves accordingly; if certain behaviors are inappropriate at home or on campus, those behaviors are also inappropriate off-campus at neighboring businesses. In addition, Elevon and other surrounding businesses have notified us that some families are still using their parking lots for drop off and pick up of students. As part of the action plan for accomplishing the goal of being a good neighbor, please do NOT use the Elevon Campus or other nearby business parking lots for dropping off or picking up your students and remind them to behave appropriately wherever they may be. This also applies to students using ride-sharing services like Uber and Lyft. These incidents are being reported to us and will be addressed with both you and your students as necessary. We thank those of our students and families who have been respectful of our neighbors; we expect all our students and families to behave appropriately in our community, as we all represent Da Vinci Schools. Our next El Camino Day is this Saturday, March 16th. The event is intended for new incoming high school students starting in Fall 2019. Students will have the opportunity to complete orientation, assessment survey, meet with a counselor for an educational plan and learn about support programs. Applications for GRAMMY Camp Are Out Now! GRAMMY Camp® is a five-day, non-residential Summer Music Industry program for high school students interested in having a career in music. Hosted by the University of Southern California Thornton School of Music (USC), students from across the country apply for one of eight offered career tracks. GRAMMY Camp faculty of music professionals, as well as guest industry professionals, provide valuable insight to give the campers the best chance at achieving success in their chosen career. Learn more at grammycamp.com and access the 2019 application. Application deadline is March 31, 2019. For more information, please contact Julie Mutnansky at jmutnansky@grammymuseum.org. The mission of the GRAMMY Museum is to explore and celebrate the enduring legacies of all forms of music; the creative process; the art and technology of the recording process; and the history of the GRAMMY Awards®, the premier recognition of recorded music accomplishment. Scholarships available – The tuition for the five days is $1500, a full scholarship would cover that, and a partial scholarship would be half ($750).